Project Scope: An outdoor living space with pre-cast concrete retaining walls and patio, a fire pit, a grill station, and a custom water feature. 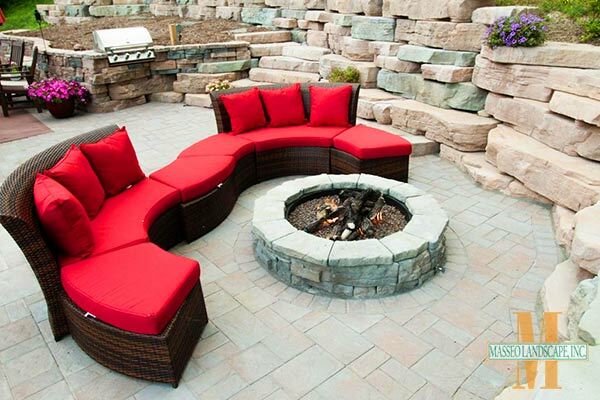 Products Used: Rosetta Outcropping and Belvedere wall stone; Rosetta circular fire pit; Cambridge Paving Stones , CAST Lighting fixtures. 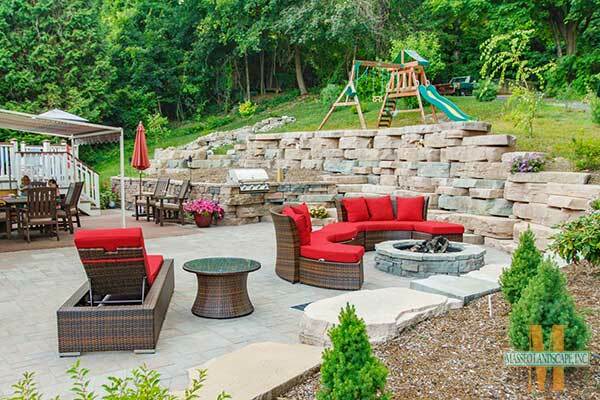 The Challenge: These homeowners wanted to get more from their yard with an outdoor living space. Unfortunately, a steep slope limited their space. While they made do with a small deck, they were looking for options to expand. Our approach was pretty simple in practice. By carving out the hillside, we could push back the foot of the slope, and create more level area. 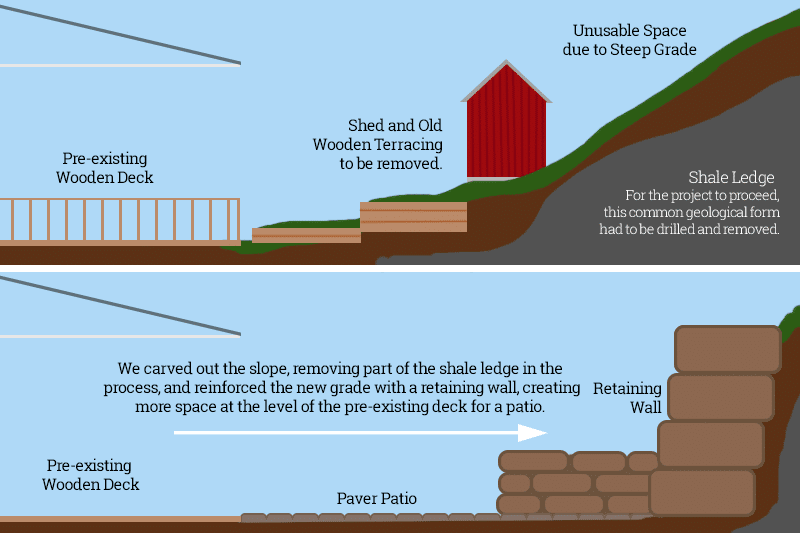 The resulting sharp drop in grade would be held back by a new retaining wall. We went with Rosetta Outcropping because, aside from looking great, it’s easy to build big and flexible. 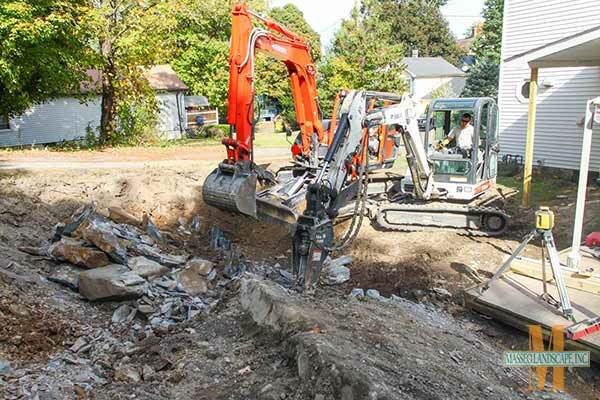 Roadblock: We encountered a shale ledge – a common geological feature here in the Hudson Valley – that blocked construction. Once we were able to drill out and remove it, construction was able to continue. Once we had some room to breathe, we got creative. We built a new patio right off the previous deck to the foot of the new walls. 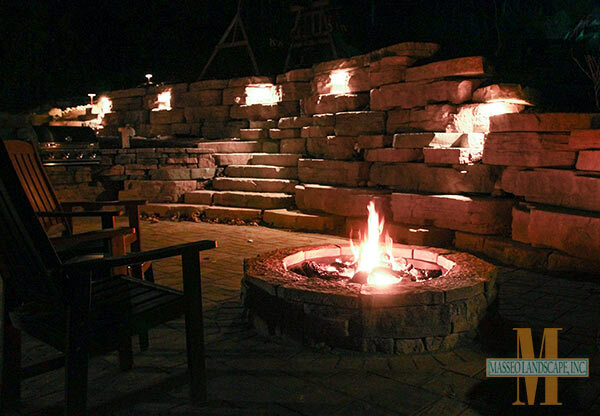 The Outcropping retaining wall curved around the yard, creating tiers for seating and privacy. We added a terraced planting bed using a smaller product called Belvedere wall stone to give the area some interest. Then we added some sweet amenities, like a fire pit with a gas hook up, and a built in grill station. One of our favorite parts is the water feature. 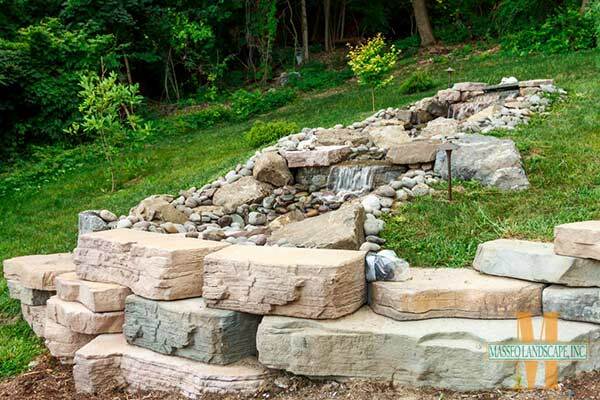 The recycling waterfall on the hill was built from Outcropping stone and river rock. The bubbling sound makes for great ambiance! Finishing Touch: We added CAST Lighting fixtures throughout the landscape. Niche lighting in the main patio area let them use the new space even after sundown. To highlight some of the more creative spaces, we added path lights to the new waterfall and planting areas. And of course, the fire pit helped too.